This training course for me was interesting for several reasons. The development of PR activities is something that interests me for the needs of my organization. I had one day of experience with training similar activities and knew it was a very creative process with the potential to experience a lot of fun. And according to the location for the training, it was a clear choice for me. My enthusiasm began as soon as I got the decision that I was accepted in the project. The first task, we should introduce ourselves to the facebook group and start uploading your first video there. It was already visible how is who experienced. I came to Athens one day in advance to see this interesting city. All Sunday, I was walking the city through the sights, museums and the historic centre. Later on, I found the Nea Makri bus exit and head for the Scout camp near the sea, 30 km from Athens. Just before the camp, I met for the first time with Italian guy Emilio, who was my roommate for the next few days. 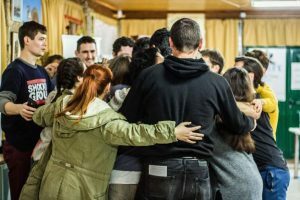 In the camp, we met the organizers, accommodated ourselves and gradually became acquainted with other participants from different countries – the Baltic states, Spain, Great Britain, Italy, Bulgaria, Romania, Greece. I was in the only one from the Czech Republic, which did not matter to me at all. On the contrary, it forced me to communicate only in English. I was fluent in English within the second half of the training. The next day, we went into the first group activities, during which we more closely mapped the situation with regard to our experience with creating videos, technologies that are needed, and so on. The course consisted of seven different thematic blocks, during which we gradually tried to create videos indifferently composed groups. The first task was to create a short personal promotional video without editing. Follow-up video watching was always a very popular activity with the option of feedback from others. Another activity was called a blind director, and it was a demanding assignment for cooperation in a film crew. With each screening, we saw successes, but the shortcomings of our work as well. We received the theoretical information in a very interactive way, so it was never boring. The”Soap opera” assignment made us remake one scene from Pulp Fiction. Again a lot of fun while shooting and more about watching. We were shouting-laughing. 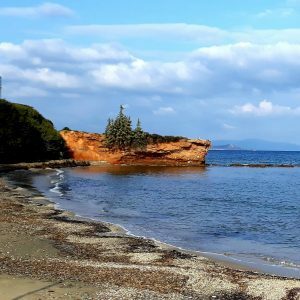 So far, we have been able to shoot in the campsite environment and the nearby beaches (yes, several times I managed to jump in the sea, because Greece is just the sea even in December, and it was great!). For another assignment, we were able to process something more committed to the idea of the project. 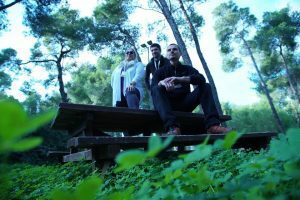 We got inspired in the neighbourhood where we were, because Nea Makri had suffered massive wildfires in last summer – pine forests, but also homes, and unfortunately, 60 people died. We wanted to show that the place lives despite the disaster and so we went to the city and made a short video full of its inhabitants and all the positive we met. Thanks to that, we have reached the places where other teams did not come and tasted the city’s life. It was a surprise for me that almost all of us, who we were asking, let themselves be filmed. And there was a Greek colleague who had to go on to edit the video, add music and subtitles. Our video has already begun to have fairly good quality parameters. One group even created such a great video that I estimate it would have multi-million views if they published that, which I hope will happen. We began to approach the training finale and picked up one of the Athens nonprofit organizations for which we had to process a short promotional video. 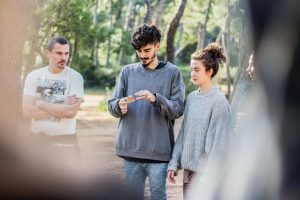 On the first day, we went to Athens to look at the situation, to get know the environment, the place and the people to shoot, to lay down the concept, to draw the storyboard and, most importantly, to talk about everything, which was not always easy. Our group has been given a charity shop that gives chances to work for people from vulnerable social groups. We put together the story of the video, think about the procedure and the next day went into action. We recorded a short promotion video, and on the rest of the day, we shared it with other participants of the training. The organizers of the project warned already in the infopack that we would work calmly up to 14h. The reality was that we have been working really long, especially because of the exciting group dynamics that training has had. Eventually, they were the organizers who reminded us that we should give breaks, relax and mainly enjoy the whole work. The intercultural dimension of the training was present very informally and naturally, which pleased me much more than organized intercultural evenings on other training. 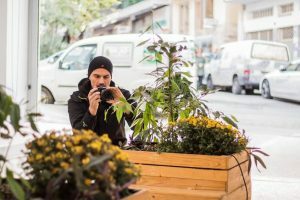 Visits to monuments could be organized by everyone before or after the project, or at the time of filming in Athens if the project job was done quickly. Food! The food was absolutely fantastic and it was a lot. We always had tea, coffee, water, and fruit during the breaks and the other meals were awesome. And now the second phase of the project is waiting for me to create something myself. I know how I know more or less what. So let’s see how to do this when I will not have this great company of people around me. I had really enjoyed this week and it was hard for me to say goodbye to some of my training fellows.